As we age, it’s common to develop new aches and pains that affect our ability to carry out our daily routine. Many elderly people complain of having trouble sleeping, whether these issues are caused by insomnia or body aches. It’s easy to dismiss this tossing and turning as a normal part of the aging process that can’t be modified or improved. While it is true that the elderly human body has gone through a normal wear-and-tear process that can cause progressive degeneration in some tissues –such as joints and muscles-, we shouldn’t become resigned to sleeping badly during our golden years. This is why it is so important for find the best mattress for seniors. There are some simple steps you can take to ensure you or your elderly loved one can get plenty of deep, restful sleep. Keep in mind that sleep offers many health benefits, from improved cognitive skills to a better mood. On the other hand, not getting enough sleep can place our bodies under a great amount of stress. Besides lifestyle changes, having the best mattress for seniors is the easiest way to ensure a good night’s sleep. Learning how to choose a mattress for elderly people can make a huge difference in your or your loved one’s quality of life. If you just want to see which mattresses are the best, here are my top picks. Or, read on to learn more details and read my reviews of these mattresses. 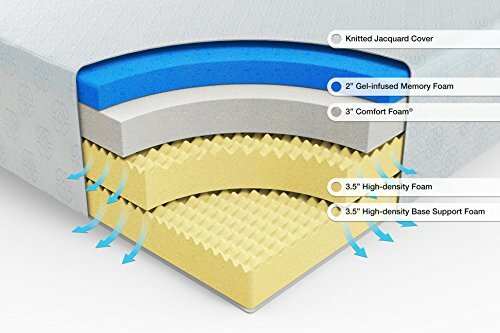 Sweetnight’s mattress benefits from three very different layers of foam. On the top there is a 3” gel layer of memory foam which provides a cooling effect to improve heat dissipation and supports your body weight properly. The middle layer features 3.5” of Air Flow Open-Cell Comfort Foam for a medium to firm, cushioned yet supportive feeling. The 5.5” bottom layer is made from Supportive High Density Foam and provides back support and spinal alignment. This mattress is made from CertiPUR-US certified materials. 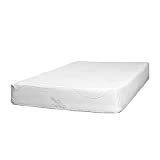 Both the foam mattress and rayon cover are hypoallergenic and resistant to mold, bacteria, allergens, and dust mites. The manufacturers also offer a 10 year warranty. The mattress comes with a removable cover that you can just throw in the washing machine when it needs cleaning. The mattress is rolled up and shipped in a box, and you’ll simply need to lay it out and let it expand for 72 hours before using it. The Sweetnight mattress is made to fit any bed frame, from box springs to hospital beds. Reviewers have high praise for this mattress. Many have commented on the fact that the mattress is firm but still comfortable, and that they don’t feel like they “sink” into it. The gel layer is also very effective at keeping a cool temperature while you lay on it. Reviews also praise the convenience of the removable cover and how quickly the mattress expands after taking it out of the box. Several buyers are elderly people or recovering from surgical procedures, and they point out that sleeping on this mattress has provided great relief for people with back pain. This mattress’ three layers provide enough support to keep your body aligned and balanced. Users have also praised the mattress for being able to support weights up to 400 lbs. Three layers of foam provide cooling effect, comfort, and support. Removable cover allows for easy clean-up. Some reviewers have found the mattress too firm for their preferences. This mattress has a medium to firm feel thanks to its two layers. The top layer measures 3” and it’s made of natural latex that will support your body in order to relieve pressure points and align your spine. For seniors who suffer from back pain, the latex’s firmness might be a better option than memory foam. It will also keep you cool, thanks to the mattress’ ventilated design that will allow air to flow through the latex. The bottom layer is 7” and features high density support foam, which will distribute your weight evenly and provide support while you sleep. 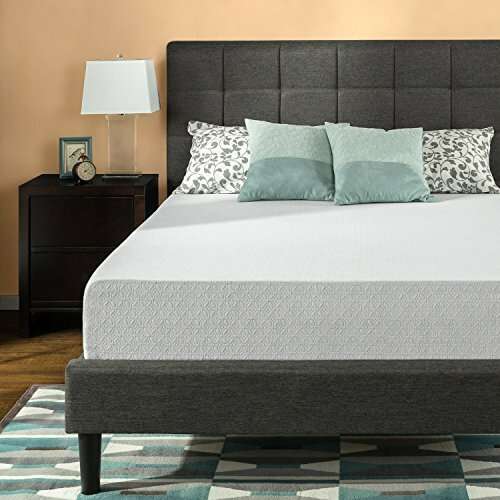 The combination of foam and latex makes this one of the best mattresses for seniors with back pain. The mattress also features a cover made of TENCEL-blend breathable fabric which will keep moisture away from the latex and foam layers. 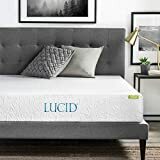 Lucid’s mattress is made using CertiPUR-US certified materials. The mattress is rolled up to allow for easier shipping. After receiving the mattress, all you have to do is lay it flat and it will expand back to its normal shape and size in just a few hours. Although the cover is removable and has a zipper, the manufacturer recommends not taking the cover off and instead spot cleaning the mattress if necessary. The reviews for this mattress are overwhelmingly positive. Many buyers have commented on the mattress’ comfortable feel. 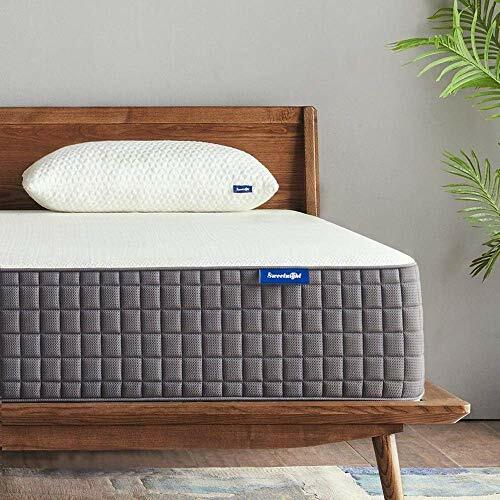 A significant amount of reviews point out that they are seniors or bought this mattress for elderly loved ones, and that the mattress has helped them improve the quality of their sleep, and relieved back and joint pain. Latex is a great option for those who need a firmer mattress to relieve back pain. The ventilated design avoids mold and moisture getting into the latex and foam layers. The latex layer provides a cool sensation while resting. Since the manufacturer advises not to remove the cover, you might want to consider buying a removable cover to make cleaning easier. Some buyers complain of the latex’s smell, which can linger for a few days after receiving the mattress. This is another strong contender for the best mattress for seniors. 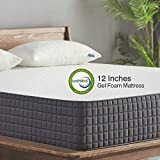 Its 2” top gel-infused memory foam has been is instilled with green tea extract and castor oil to keeps the materials fresh. These components will keep odors away and avoid bacterial growth thanks to its natural astringent properties. ActivCharcoal is also used to reduce odors and absorb moisture. The gel will help redistribute and diffuse heat to maintain a cool temperature while you sleep. A 3” Comfort Foam layer provides cushioning and plushness. Two 3.5” high density foam layers sit on the bottom of the mattress. These layers ensure that the mattress is firm and supportive enough for seniors with arthritis or back pain. The mattress is covered in a hypoallergenic, knitted jacquard cover which you can remove in order to wash it. All the materials used in this mattress are CertiPUR-US certified and the manufacturer offers a ten year warranty. It is compressed and rolled for easy shipping, and can be used on a variety of bed frames. It might be important to note that the manufacturer states that some conditions, such as cold weather, can increase decompression times. Reviewers have stated that the mattress has a medium to firm feel, and that the sides of the mattress are firm. Some buyers have praised the mattress for relieving their back and pressure point pain. Others happily state that since buying this mattress, their sleep has improved and they don’t wake up in any pain. They even claim that the mattress seems to get more comfortable over time. Natural components such as green tea extract, castor oil, and activated charcoal act as antibacterial agents and keep the mattress odor-free. Numerous layers make this mattress firm yet plush and comfortable. Gel-infused memory foam will keep you cool while you rest. Removable cover that you can throw in the washing machine when needed. There is a fiber glass layer under the outer cover which acts a flame retardant, but can be problematic for people with respiratory ailments. Some reviewers state that the natural components give this mattress a characteristic smell at first. However, most note that the smell disappeared after some time. Images, Ratings, & Prices from Amazon Product Advertising API - Updated on 2019-04-22 at 18:57 - contains affiliate links (see footer). This mattress offers a medium to firm surface thanks to its three layers. The 2” top layer is made of natural latex, which provides firm support which relieves back pain and keeps your spine aligned. The latex layer makes it one of the best mattresses for seniors with arthritis, since its firmness relieves joint and pressure point pain. The middle layer is made of gel-infused memory foam and measures 1”. The gel, combined with the upper latex layer, give this mattress heat-dissipating properties which will keep you cool all night. The bottom layer measures 7” and it is made of high density foam which will stop the mattress from sagging under the user’s weight. The mattress also features a cover made of organic cotton, which is hypoallergenic and hasn’t been treated with any harsh chemicals. Its natural, soft feel will enhance the quality of your sleep. Organic cotton bedding is a great option for people who suffer from allergies or have sensitive skin. However, the cover can’t be removed to wash it. 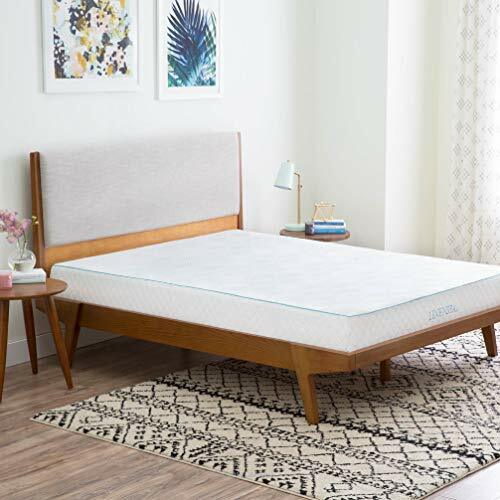 This mattress uses CertiPUR-US certified foam, meaning it is free of toxic chemicals, flame retardants, ozone depleters, mercury, formaldehyde, lead and heavy metals. It comes rolled up inside a box, and after laying it on a flat surface, it will decompress in 24-48 hours. Although it doesn’t contain any flame retardants, the natural latex functions as a natural fire retardant to keep your safe. Most reviews are highly positive, with many even stating that this is the most comfortable mattress they have ever slept on. They point out that the mattress features good side support and a firm but plush feel. One happy customer reports that this mattress has alleviated her arthritis symptoms, which no other mattress had ever accomplished. Reviewers also appreciate the fact the there is no odor to this mattress. Buyers state that they can’t feel their partners moving in the mattress, which also makes this one of the best mattresses for older couples. Latex and high density foam provide firmness and support to alleviate back and/or joint pain. Good option for elderly couples. Organic cotton cover is soft and hypoallergenic. Its materials will dissipate heat and maintain a cool temperature. The cover isn’t removable – you might want to invest in a waterproof cover to avoid spills or accidents. Linenspa’s mattress features a 3.5” top layer made of gel-infused memory foam. This foam is constructed using open cell technology which makes it more durable. The foam is infused with gel beads that capture and distribute heat to provide a cool temperature while you sleep. Stomach sleepers especially appreciate the benefits of a cooling mattress. The top layer also features a ventilated design that maximizes airflow in order to prevent odors, mold, and bacterial growth. The bottom layer is 6.5” and made of high-density support foam which gives this mattress a medium-to-firm feel. These layers help relieve pain and pressure points by supporting the natural curves of your body and keeping your spine aligned. The mattress also features a soft, breathable bamboo cover which can be removed when it needs to be washed. The materials used are CertiPUR-US certified and have been tested for durability, quality, and safety. The manufacturer also offers a 25 year warranty. The mattress can be used on a number of different frames, including medical and adjustable bed frames. Reviewers have praised this mattress for its firm construction and durability. Many reviews state that they have owned the mattress for a number of years and it is still comfortable. Reviews also state that it isolates movement so that they aren’t bothered when their partner moves, making it another great option for couples. Additionally, this mattress has been widely used by elderly people and patients with chronic diseases. Their reviews state that their back and joint paint has been greatly alleviated after sleeping on this mattress. These features make this another great contender for the best mattress for seniors! 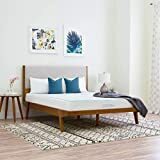 CertiPUR-US certified (no harmful odors), resistant to dust mites and safe for youth - Queen Size: 60" x 80"
Why Do So Many Seniors Have Trouble Sleeping? There are many conditions that can make it difficult for seniors to get a good night’s sleep. Some of these conditions can be managed with simple lifestyle changes, while others might require more extensive and specific treatments. However, sleeping on a good mattress will help regardless of what is causing these sleep disturbances. Good sleep is extremely important to maintain cognitive skills and a stable mood. People who sleep well have a longer life span, healthier weights, and lower stress levels. Sleeping poorly, on the other hand, can put seniors at risk of cardiovascular disease, irritability, diabetes, and chronic pain. Ironically, many people believe elderly people sleep too much. But usually this is because they are not getting a good, restful night of sleep and have to catnap during the daytime. Below are some of the age-related problems that cause sleep disturbances, and how finding the best mattress for seniors can help with these problems. Conditions that cause chronic pain, such as osteoarthritis, fibromyalgia, and chronic back or hip pain. Musculoskeletal degenerative disease are more common in seniors, and learning how to choose a mattress for elderly people can be a life-changer. A firmer mattress which can provide stronger support can be extremely helpful in these cases. Mattresses that alleviate pressure points and promote proper spine alignment are optimal for seniors who suffer from chronic pain. If your elderly loved one suffers from circulatory deficiencies, a mattress that can be used on an adjustable bed frame will allow them to sleep in many different sleeping positions. This will improve blood circulation and relax their muscles, offering them pain relief and less cramping making it more likely they will enjoy a good sleep. Patients with obstructive sleep apnea and other respiratory illnesses can also benefit from sleeping in a semi-seated position using an adjustable bed frame. Neurodegenerative conditions can also have a negative impact on your elderly loved one’s sleep. Diseases like dementia, Alzheimer’s, Parkinson’s, and clinical depression can cause anxiety and insomnia. Seniors with these illnesses will benefit from sleeping on a comfortable mattress, such as one that features memory foam. Also, using a heat-redistributing material such as gel-infused foam or natural latex, can provide them with a cool sensation that will make it easier to fall asleep. Other causes for sleep disturbances in elderly people include frequent urination, restless leg syndrome, and acid reflux. Certain medications such as beta-blockers, bronchodilators, diuretics, decongestants, and corticosteroids can also make it harder for a senior to get a good night’s sleep. Can You Really Buy a Mattress Online? Surprisingly for some, the answer is yes! And, shipping is also usually free. Here is why. Mattresses like these ship in a compressed state. All the air is sucked out of them and they are packaged in a tight plastic wrap that keeps them this way. Once the mattress arrives at your home, you unbox it and (carefully!) remove the outer wrap. The mattress will naturally expand back to its original state – usually within 24 hours. There are certain characteristics that make some mattresses more comfortable for seniors. Keep in mind that, depending on your elderly loved one’s health and physical condition, some of these features might be more important to them than others. Foam Density: sleeping on a saggy mattress can cause back pain even in young, fit adults. Higher density foam will contour the body, and support the spine and joints. This type of mattress foam is also ideal to relieve pressure from key points of the body, such as the neck, lower back, hips, and shoulders. Cleanability: being able to clean a mattress easily is a huge plus. Seniors are especially prone to dirtying their mattresses. They might spill food or other substances due to muscle weakness or tremors, or in some cases, they might soil the bed. In these instances, being able to remove the cover of your mattress and simply throw it in the washing machine will make cleaning up much easier. Of course, you can always invest in a separate waterproof cover for the mattress. Soft vs Firm: although each person has their own preference, firmer mattresses are generally a better fit for seniors. A firmer mattress will keep their spine aligned and their joints in place. This will alleviate chronic pain, and prevent muscle and joint soreness in the morning. Firm sides: a mattress with firm sides will make it easier for your elderly loved one to climb out of bed. It will also help maintain the shape of the mattress, making it less likely for seniors to fall out of bed. Latex: this material is a great option for those who need a firmer surface and want to find the best mattress for seniors with back pain. It provides a firm feel which supports your body and joints, while also keeping a cool temperature to encourage deep sleep. Latex also acts as a natural fire retardant, which can be a great feature for seniors who live alone or are prone to accidents. CertiPUR-US rating: CertiPUR-US is a certification program run by a not-for-profit organization. In order to be certified by CertiPUR-US, foams have to be free of ozone depleters, PBDEs, TDCPP or TCEP (”Tris”) flame retardants, heavy metals, and other harsh and toxic chemicals. This is done to assure low emissions and high performance. Buying a mattress with this certification ensures that you are not coming into contact with substances that can cause cancer, birth defects, and can harm the environment. 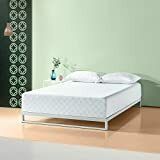 How to Choose the Best Mattress for an Older Couple? Some people think it’s impossible for an elderly couple to sleep comfortably together. That is absolutely untrue. The key to finding the best for a senior couple is in the materials. High density foam and a top quality construction will isolate each person’s movements so that their partner’s sleep isn’t bothered. Couples can also look for a mattress that combines each of their personal preferences. For example, a mattress that combines latex and gel-infused memory foam might be a great option which can please both partners. Now that you know which features to look for in a mattress for your elderly loved one, it will be much easier to find the best option for them. The ones listed in this article are only some of the great options that you can find online. Of course, there are many other manufacturers and sellers which can provide you with the best mattress for seniors – as long as the materials are top quality, the choice is down to personal preference. In my opinion, it’s hard to top . Its numerous layers make it a firm, yet comfortable mattress. Also, the addition of natural components such as green tea extract and castor oil will keep it in top shape for many years. However, any of the mattresses featured in this article will provide seniors with great sleep. You just have to keep their physical condition and preferences in mind in order to make the best choice! Know a senior who prefers to sleep in a recliner? Learn more about that here! Have you purchased a mattress for a senior? Which one did you choose and why? Feel free to share your thoughts and opinions in the comments below!